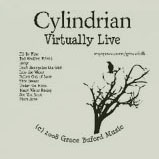 The CD contains LIVE recordings of Grace Buford’s performances in the VIRTUAL world of Second Life where she is known as CYLINDRIAN Rutabaga (Cyl), so the title of the CD “Cylindrian Virtually Live” is quite obvious. My favourite is by far “Bad Weather Friend” – Strings, lyrics and vocals are just gorgeous. within the US. The CD will be sold out soon, but Grace will make it available on iTunes, Rhapsody and Napster in about 3 to 4 weeks. I will post the links as soon as I get them. Second Life® is a registered trademark of Linden Research, Inc. All rights reserved. No infringement is intended.